What signal would Mubarak resignation send to Mideast? Two weeks ago – nobody estimated the size of the story that was unfolding in Cairo. And I'm not sure anybody still does. It's entirely possible that what we've been seeing on our TV screens for the last two weeks could reach far beyond the borders of Egypt. There are already rumblings across the Middle East that something much larger is happening. If and when Mubarak steps down - he'll be following Tunisia's president, who was pushed out of power last month after similar popular uprisings. Yemen's president has said he won't seek re-election when his term is up - and that he won't hand power over to his son. And, after calls for reform - Jordan's King Abdullah sacked his whole government and appointed a new prime minister. Meanwhile - protests, facilitated by technology like Facebook and Twitter, have sprung up everywhere from Algeria to Sudan and Syria. It seems that after decades of repression in some of these countries... the people are finally being heard. Earlier this week, U.S. Defense Secretary Robert Gates was asked about a possible domino effect in the region. He described what's happened in Tunisia and Egypt as a "spontaneous manifestation of discontent" coming from people who have both political and economic complaints about their governments. Gates says he hopes that other leaders in the region take note of what's going on in Egypt and Tunisia and start addressing their citizens' concerns. My guess is they may not have much of a choice. This would show the people that they can obtain their freedom if they come together as one. Democracy and human rights are inevitable as humanity continues to evolve to whence we came, Yaweh, the beginning and the end. It would send a message that anything is possible even for a country that turned into a dictatorship 30 years ago. It would leave other Middle East Countries realizing that with all the modern technology it next to impossible to stop protesters from organizing and staying in contact with each other. Iran has already locked up one of the leaders from their last protest. People in the Middle East are able to see and learn how other nations are living. They're tired of being suppressed and they want more freedom. Something like that is hard to stop because the idea for freedom starts in their heads and ends up in their hearts. The heart of Egypt is its people and that heart is broken. The signal Mubarak's resignation would send would be that Egypt's heart will be mended. That public unrest can be extremely difficult to deal with, for all, including the government, and the citizens. It send the message that if you want democratic changes the best thing you can do is take to the streets peacefully, not burn American or Israeli flags, and make no hostile moves against the military. This is how you demostrate to the world that you are ready for democracy. I think Egypt is ready. Egypt has historically lead the way in the Middle East and if this is no different the Middle East might actually have a bright future. The signal that it would send would be loud and clear that democracy is on the march and that it has a life of it's own. The middle east will no longer be able to blame the west for all of it's problems. It should send a chill not only to the politicians in the Mideast, but around the world. In every country, people are growing tired of all the games that are being played at their expense. If it can happen in Egypt, it can happen anywhere – including the United States. I think it will tell King Abdullah to double his guard and start looking over his shoulder more. Jack: It would mean that people do matter when they say, "enough is enough." The ideas of democracy which began in Greece some 2500 years ago are well an alive. The military could have opened fire an killed many thousands of people, but decided not to fire. Brave people asking to be heard and represented by people they choose in an election. Freedom is the best cure for apathy. Leaders of other Mideast countries are most likely thinking, "I wonder if it is to late to make nice." The people of those same countries are thinking, "It's time to make history boys and girls. Time for a flash gathering. We have the hope, now it is time for the change." It would signal Mubarak resigning. That there's a limit to everything and then it becomes "enough is enough". It's called REVOLUTION Jack. It would send the message that buddying up with the USA was a mistake. Better make sure the unemployment rate stays low. That's what started this whole thing. Get in line and do the same because good ole USA will eventually end up paying for all that this "party" will cost, down the road. That his government was unpopular and he saw little chance of holding power. A message most governmnts in te region fear. The signal immediately sent will be that Mubarak acknowledges that the "REBIRTH" of Egypt is at hand, and he for the first time will put the people first. Mubarak let your people go! Who cares what the signal is. The people of Egypt have spoken and that is the only worth watching signal. They said no more and started walking. Good for Egypt. Peace and Prosperity to them and all of us. Get out before your people throw you out. It would be twofold Jack. The people's voices are greater than tyranny & oppression & American government's voice abroad pacts enough punch once again to throw in the knock out punch. Pow! It is starting to happen already. We're seeing regimes in Jordan and Yemen looking over their shoulders. The autocratic and selfish policies throughout the region are coming to light to the 'common' man, who now wants his share. They will need to clean up their corrupt systems, and share both the power and the wealth. Why does an 82 year old man like Mubarak need $70 billion ... that's nearly one-third of the GDP of the entire country? 1. People 84 years of age probably need to retire. 2. Young tweeters have a lot of power and love to express their freedom. 3. Other countries need to take young people more seriously and let them tweet before the established leaders have to re-tweet. The power of the voice of the oppressed people all over this area of the world will be heard. Love of freedom and love of democratic change will not be held back by empty promises of these self-proclaimed leaders and father figures that have lost sight of the needs of their country. The torch of Freedom has been lit by people in Egypt and they will continue the crescendo of their voices until removal of tyrants in this country and in surrounding areas is accomplished. Those that are in power must heed the frantic, impassioned cries for freedom and fear the reprecussions that will ensue. Don't believe he wll resign. Given that in breaking news it was announced that Mubarak isn't resigning, I suspect things are about to get a lot worse. Mubarak's just another politician who doesn't listen to what the people want. It would mean autocratic rule could be ended by only demonstrating in the streets. Which is why he won't resign. That the people are running the country and the other countries better walk softly. That the people are the ones with the real power, not autocrats, dictators and the like. Today's disappointment notwithstanding, the Net is still mightier than the dictator. Laptops, Blackberries and I-Pads are the cannons of the new age—Google, Facebook and Twitter the grenades, bombs and rockets. Don't lose faith young freedom-fighters, the prize is within your peaceful grasp. I've been listening & watching, I'm not at all surprised that he's not stepping down, he continues to keep his deaf ear to the people he's hurting, he has shown he doesn't care for any of his people, it's all about "poor him", it hurts his heart-my heart goes out to those poor people, the anger is going to increase, just like the building volcanoe,all at once there will be a deafing explosion...he hadn't gotten thro half his speach, I knew he wasn't going to step down & right now there isn't anything our President can do, except for what he's already doing..the only way that he would leave is if something happened to him..if he had & the other countries saw this, that would give a lot of ideas to others about what they might try to do in their own areas, we would see a lot of action pop up all over, the people are furious & rightfully so. It's a moot point now, isn't it? He's going nowhere. He's clearly delusional, and living in his own world. He's clinging to the bogus thread of "constitutional" transition...where was his constitutional conscience when he was systematically stealing the estimated $30-75 BILLION over 3 decades while his country wallowed in poverty??? Mubarak by any other name is still Suleiman. Mubarak Let Your People Go!!! Egypt and its people belong to God...not you! God Bless Egypt!!!! God Bless The World. With no one in charge, whoes to run the government? As we have seen in past revolutions, this would only lead to corrupt groups taking power. Iran, Russia, Napoleonic France?, the list goes on and on. 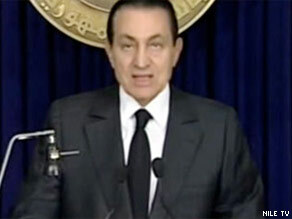 Mubarak's resignation will reinforce in strongest terms that turly power resides with people. To the leaders of these Middle Eastern countries the message becomes very clear, serve your people and do the right thing for your country. New World Revolution! The division between the people, Corporation, Dictators, and guilty politicians around the world: did not read the writing on the wall. But, unfortunately, it is too late! Time has arrived for the underground revolution! Nothing will change. Audacity of Hope is only for Americans. Better get out while you can. These guys really mean business.I guess sooner or latersmart people wise up to the "con jobs we`ve been giving them. Time to go. More to the point would be the signal sent to the peoples of those countries, and governments in Syria, Jordan and Pakistan would surely be at risk. Others, not so much, either due to recent changes or repressive regimes with no qualms of using violence to suppress dissent (Iran). It would tell the other leaders that "their time is up". Knowledge is power and their oppressed minions can no longer be lied too. It will depend on what comes AFTER him. If Mubarak really resigned, and then a true democracy became the government in Egypt, that would tell other Middle East countries that people are sick and tired of being forced to live in a repressive society. If what comes after Mubarak is a religious based repressive society similar to Iran (and Saudi Arabia) then it will tell the people that they have no options. And it will send us a message too, one that we had better pay attention to. It will say that the extremists have won, and want to continue winning. Jack, the signal a Mubarak resignation would send is this: Deliver social-economic justice, equality and democratic reforms to the people or be prepared to relinquish power to the people when they rise up and take it!! All countries in this world, including western countries would do well to heed this message and respect their people. Patrick Henry quote" Fear Is The Government Of Slaves". The people in Egypt is fighting for their freedom, and just like in America...They Shall Overcome. God Keep Your People Under Your Covenant...Mubarak...Let God's People Go! He is going nowhere. I served in Cairo as a member of the USAF. It seems like on every corner there is a policeman or a soldier. There might not be food for 20% of the people, nor running water in many parts of the city, but It might be the safest city for a tourist in the world. But with that security there comes a price. These guys don't yield power- they wield power. This was my original answer to your question that I wrote before Mubarak spoke. It's the 21st Century. Time to put your camels out to pasture and enter it or you're next. "Hang on at all costs. Your powers and privilege trumps the wants and needs of your people. Let them eat cake." Correction to previous quote by Patrick Henry..."Fear Is The Passion Of Slaves" is the correct quote. It'd signal the completion of his funds transfers. What signal would Mubarak's resignation send ...? There are 21 Middle East countries: Algeria to Yemen. Their governments range from the tightly controlled Saudis, Iranians, to democratic Israel. The economies range from the great personal wealth of Kuwait where most work is done by immigrants to Sudan, one of the poorest nations in the world. The majority of citizens of the Mid East will not notice nor take any particular signal when Mubarak leaves; tomorrow or September. The Egyptian Army is highly armed, well trained and has the latest U.S provided weapons and equipment. They will decide on the course Egypt will be taken. The citizens in the streets only have sticks. The Middle East citizens know this. The Murbarak situation in Egypt sends the message to leader's around the world if you don't wish to share house arrest with Lindsey Lohan you better start spreading a lot of freedom and Democracy to the people. A start in America is repeal of the Patriot Act and gain control of Banking and Mandatory Insurance piracy. He's not leaving it looks like, until after he gets his check from his "Uncle". Except, his other "Uncle" (Saudi Arabia) will bank roll him. The Egyptian people and all the world leaders will have to keep the pressure on him, until he goes. There is no way we should get involved in this matter. It's totally up to the Egyptian people. Murbarak really has a country on strike, against him. Simply put, it would let the world know that if the people want change from there government, rise up and get it, collectively the people have a loud voice, and a stong arm. It is tragic that after all the protesting Mubarak and Suleiman still remain in power. I am delighted that the Egyptian people will not tolerate this and are united for change! The "Eyes of the World" will be the protesters best protection. Jack, it never ceases to amaze me that we here in the USA, and also the West value liberty and democracy above all else, and that is because we have the institutions and wealth to have the other neccessities that make life democratic. The Egyptians do not. Right now, a few hundred thousands are protesting for liberty, but what is lost in this so called "uprising" is that in the end, reality will set in, and the Egyptian people, including those now protesting, will look towards whomever that will provide them with some assistance for food, housing, and work. That Jack, means that the Muslim Brotherhood, probably with some support from "young turks" in the Army will manage to assume power with the concensus of the Egyptian people. That also, will mean an "Islamic State". It will also mean the spread of fundlementalist Islamic influence across the middle east, including Saudi Arabia. This should show other Mideast countries that the youth of today will stand up and throw off the yokes of dictatorship and oppression, even those extreme religious binds. We should all hold our collective breaths as we witness a rising of hope through the voices of the world's youth. Dictators don't stoop to "getting signals". They all feel they are invincible and all powerfull. It would mean that the Egyptian people created their own path, not the US whom need not meddle.